Rhythmbox 0.13.1 has been released yesterday and while it doesn't bring many changes for the end-user, there's one improvement which is definitely worth mentioning: improved handling of files on unmounted devices and network shares - now Rhythmbox only attempts to check files on core filesystems and mounted local devices and doesn't check files on network shares, relying on playback error reporting to identify missing files. So if your music is on a device which you forgot to mount, Rhythmbox won't remove the files from the library. For a complete list of improvements and bugs fixed, see the Rhythmbox 0.13.1 release announcement. Rhythmbox 0.13.1 has already been uploaded to the official Ubuntu 10.10 Maverick Meerkat repositories so do an upgrade and you should have this new version. Ubuntu 10.04 Lucid Lynx users can use our Rhythmbox PPA which comes with the latest Rhythmbox 0.13.1 backported from Ubuntu 10.10 Maverick Meerkat. In case you're wondering, no - the AppIndicator has not returned so you will not have an appindicator when using Rhythmbox from this PPA - that's because the AppIndicator has been removed from Maverick (Rhythmbox now uses the Sound Menu so the AppIndicator was not needed) and when trying to use the old patch, Rhythmbox fails to compile. 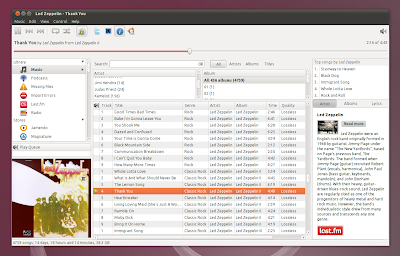 The WebUpd8 Rhythmbox PPA for Ubuntu 10.04 Lucid Lynx also comes with the latest Rhythmbox Radiobrowser and UbuntuOne Music Store plugins backported from Maverick so if you have these installed, the above commands will upgrade these plugins too. Since this package has been backported from Maverick - with no changes on my side, please report any bugs you may find on Launchpad.